Its time for another awesome version update for Localscope! V1.5 makes Localscope your Go To application to browse your vicinity and navigate to a point of interest. With this release, we extend the power of choice to our users - not only can you decide the search engines you want to use to discover new places or view your vicinity in List, Map or Augmented Reality view, but also choose your favorite navigation app to get you there, in your preferred language. While these two integrations proved to be very useful for our users, we also heard that many of you like to use different apps for navigation due to the various benefits they offer. A large number of users use MotionX - the top grossing app in the Navigation category - with turn by turn directions and an appealing price ($0.99) MotionX GPS Drive is hands down the best and the most used navigation app. Others prefer using the free and community based real time crowd sourced traffic information app, Waze. MetroView a highly popular navigation app in Australia and New Zealand provides detail local maps and voice guided turn by turn directions, all in an unmistakeable Australian accent is a clear choice for the users down under. And some simply find Navigon MobileNavigator and TomTom too expensive. So we decided to increase our family of integrated applications to include these three popular applications as well. If you already have any one of these applications installed - MotionX GPS Drive, Waze, MetroView Australia, MetroView New Zealand, TomTom or Navigon MobileNavigator, Localscope will smartly detect them & enable you to launch one of them to navigate to a location. 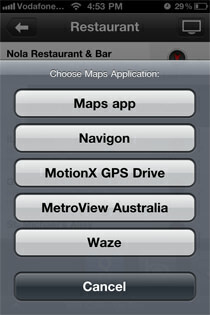 For the rest, the integration with the default Maps App can help you find directions to your destination. Both these actions, slide up the options to start navigation to a destination using either the Maps App, MotionX GPS Drive, Waze, etc.. Tap on the navigation app of your choice to immediately initiate a turn-by-turn voice based (except Maps app) navigation to your place of interest. We have been listening and with Localscope v1.5, we begin our journey of enabling users worldwide to use their favorite GPS app in their native language. Localscope’s search terms are now optimized for German, French, Italian and Spanish so you can search and find destinations around you in your language, enabling a seamless experience. This is just a small start and more language support is planned for the future. Watch this space to know when Localscope starts speaking your language. With Localscope v1.5, we have also improved sharing with Facebook. A thumbnail image of the map point is automatically attached and shared with the link to the location that you share with your friends on Facebook, giving them a quick glimpse of the point on the map. Also newly enabled is the shortcut to go to the top of any list within Localscope - simply tap on the device status bar and you will be taken back up to the top of the screen. The new and updated version of Localscope is now globally available on the Apple AppStore, for US$1.99 (or the equivalent in other currencies). Visit the AppStore to get your copy now. With this new release, we’re confident that we’ve added something special to the navigation apps you already use. Enjoy the new Localscope 1.5!